I’ve written elsewhere in this blog about general sharpening. (For example, read “Why Doesn’t This Plane/Chisel Work Like It Should??”). This article will focus on a special honing guide for handling some of the blades/irons that don’t play nice with my usual guides. I have a couple of new spoke shaves, both of which need an initial sharpening. With the length and width of the irons, they require special attention. If you aren’t using a micro-bevel, hand sharpening is at least within the realm of possibility for many. The bevel is fairly wide, with the iron ground at 25 degrees, so it’s not too difficult to feel whether you are riding the bevel. Since I do utilize a micro-bevel, to minimize the time I spend sharpening, I started looking for a new honing guide compatible with these irons (as well as some other irons/chisels). I read about a couple of interesting honing guide designs made by Richard Kell. Both are very similar, with the only difference in the maximum blade holding width. The smaller version will hold chisels/irons up to 1” wide, where the large version will hold items up to 2-5/8” wide. Both versions have two separate wheels that ride just wider than the work being held. The wheel configuration does limit the guide’s ability to apply a camber. Since my primary intended usage is in sharpening the spoke shave irons, I knew the iron’s width demanded I have the large Kell honing guide. Even with the larger capacity, I can still use this guide to sharpen even my narrowest chisels. With this information, some might question why anyone would buy the smaller guide. On extremely narrow blades/irons, the shorter guide rails of the small version may feel less cumbersome to some, but this is a personal preference. The Kell guides are unique in that they utilize the guide rods as a reference surface, with the iron/blade riding below them, and the bottom surface against the rods. This can be a benefit if the top surface isn’t parallel to the bottom surface. Many other honing guides hold the iron in the opposite orientation. Just next to the inside surfaces of the wheels, there are replaceable polycarb washers. These washers are what directly contact the outside surfaces of the iron/chisel when clamping. These units place adequate pressure to the iron/chisel, with only hand tightening. Each Kell honing guide comes with a instruction sheet, including data relating to sharpening a range of angles. The data specifies how far the iron should project for each angle. I like to make quick-reference blocks so I can set the projection exactly the same each time. When making my reference blocks, I first set my iron so it rubs the whole bevel when touching the stone. For my irons, the projection distances required just a bit of tweaking to match exactly. Once I have it right on, I put the iron over the edge of a piece of MDF. I then apply some super glue to what will be the bottom surface of my reference block. I put the block up against the leading edge of the iron, and hold it until it is set. This first one is for 25 degrees, so I can refresh the grinding angle, after the micro-bevel has grown with multiple sharpenings. Next, I repeat this procedure for my 5 degree micro-bevel (30 degrees total), on the opposite side of the MDF. 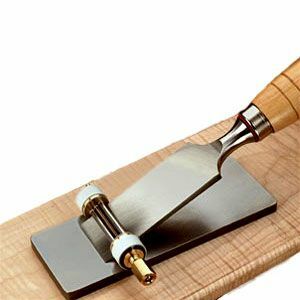 For the actual sharpening techniques, read “Why Doesn’t This Plane/Chisel Work Like It Should? ?” for a thorough explanation. I still use the same 1000/8000 Norton waterstones for both the micro-bevel (and primary bevel when needed) and removing the burr from the back. The Kell honing guide is quick and easy to use, and provides repeatable results. I’ve used the guide on some of my Japanese chisels and plane irons, too, with good results. So far I’ve not found any detracting features that would prevent a positive recommendation. I hope to see some of you at one of our upcoming events, listed on the Lie-Nielsen website. To watch an excellent demo video of the sharpening process, click here. The hardest thing for me with sharpening was getting a honing guide that I could repeat my bevel with over and over again. And I am a total fail at free hand sharpening my Japanese Chisels. I love the side clamping feature on this Kell honing guide, but my complaint is that there is so little finger room to push the tool. And I am female with smaller hands than most guys. But it really is the only guide that works with my Japanese tools. I splurged on the new LN honing guide for irons and chisels, and it really is nice. A little tough on small 1/4 and forget 1/8 chisels though. And I go back to the Kell for my Sorby mortise chisels. Guess you can’t have them all. The Down to Earth Woodworker: Summertime Woodworking Near Atlanta? One Day In-Store Sale at Highland Woodworking Tomorrow!